Posted on Mon, Oct 5, 2009 : 6:02 a.m.
Steve and Kelly Van Singel play with their two daughters, Magdalyn, 7, left, and Gillian, 4, at their Pittsfield Township home. EMU is opening a new autism center that will benefit Magdalyn and Gillian. But the appointments carry more significance than typical play dates and lessons. Her two daughters, Magdalyn, 7, and Gillian, 4, were both born with autism spectrum disorders. 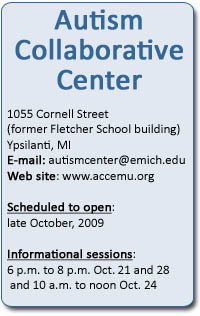 The Van Singel family is looking forward to this month's opening of theÂ Autism Collaborative CenterÂ run by Eastern Michigan University for autistic children, teenagers, adults and their families. The center will be housed in the former Fletcher School building in Ypsilanti. EMU purchased the building from Ypsilanti Public Schools this summer; a variety of services and programs, including diagnostic evaluations, will be available with fees charged on a sliding scale. "We're so excited to have the center," said Kelly Van Singel, who lives with her husband, Steve, and daughters in Pittsfield Township. "You have a lot of diagnostic and research-based resources here, but there aren't as many hands-on, therapeutic, family-service type resources in the area." In focus groups run by EMU last summer, Van Singel and others expressed their desire for a center like this one. Parents were looking for a central place to meet and exchange ideas and information with other families in a place that also offered autism support services and therapy. Up until now, Kelly Van Singel has driven her daughters to Jack's Place for Autism in Southfield and and the Abilities Center in Walled Lake. Magdalyn is verbal with good academic skills, while Gillian can't speak. The Centers for Disease Control and Prevention defines autism spectrum disorders as a group of developmental disabilities that cause social, communication and behavioral challenges. "They're closed off from the world around them, but it's not because they're not smart. To me, what autism is, from seeing the way my girls interact with the world, is that the different parts of the brain don't integrate or talk to each other very well," she said. "They have problems with sensory integration - sounds, textures, tastes - bombarding their sensory system." While there is no cure for autism, different intervention therapies have improved her daughters' conditions, Van Singel said. But those therapies are expensive, can carry long wait lists and aren't covered by insurance plans. Without close attention, she says the girls' progress could reverse. CDC statistics show one in every 150 children are diagnosed with autism spectrum disorders, and the disorder can vary widely from individual to individual. They range from those who may have higher-than-usual intelligence and can function normally except for some social challenges, to those with severe mental disability. Autism lasts a lifetime, and there are fewer resources for adults than children, according to several experts. That gap in services for teenagers and adults is something the center will address. In addition to programming and services for autistic individuals and their families, research at the center will help determine effective interventions and treatments for autism spectrum disorders. And families of autistic individuals are welcome to use the center as a central gathering place. "We want to serve the needs of the whole family, because we believe that makes the life of the individual with autism even more productive and independent," said Pamela Lemerand, the center's project director. The center's partner organizations include St. Joseph Mercy Hospital, Easter Seals-Michigan and the Judson Center, which collaborated this summer to run inaugural day camps for autistic children. The center is also a boon to academic programming at EMU. Undergraduate and graduate students from nine disciplines will benefit from new education and training opportunities it affords, said Jim Lyddy, executive director of the center. Those opportunities include dietetics and nutrition, nursing, special education, music therapy, occupational therapy, psychology, therapeutic recreation, social work and speech and language therapy. The center will share faculty from nine EMU departments and will have three full-time employees, including occupational and speech and language therapists and a psychologist. Faculty and staff will supervise the students. The idea, Lyddy said, is that while students work together with faculty and staff and learn about different disciplines, creative pairings of traditional therapies will help autistic individuals. Amy Sanderson, the director of programs and services for the center, has first-hand experience with autism as the parent of a 6-year-old autistic son. Her 8-year-old daughter faces her own unique challenges in dealing with a brother who requires a great deal of attention. 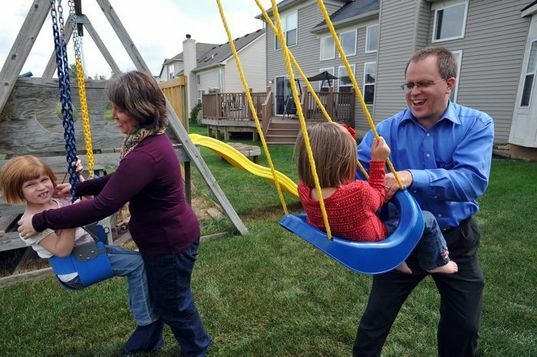 It's hard to relax with the whole family outside of the home, she says - a trip to the playground, for example, means side glances and questions and curious stares. She hopes the center will take the pressure off families who strain to fit into a system that isn't always welcoming of differences. Programming will be planned on a quarterly basis to make sure it serves the needs of those currently using it. Pam Misch, director of special education for the Washtenaw Intermediate School District, said this area attracts families with autistic children for a number of reasons. The WISD, which works with 10 Washtenaw County school districts, is a regional agency that works to coordinate highly specialized programs, like special education, which are too expensive for single school districts to offer. The organization sticks to the philosophy that students should be educated as close to home as possible with the appropriate supports in their community, Misch said. About 250 severely disabled students are educated in classrooms run by WISD staff, including about 25 severely autistic students. Misch said a great support network is available for parents with autistic children, and the University of Michigan Autism and Communication Disorders Center is nationally renowned, with a focus on diagnostics and research. Despite the variety of support services and private therapy available in Washtenaw County, Sanderson said more services are needed. The Web site for the U-M center notes a six-month waiting list for diagnostic services - her son waited for more than a year to see a private speech therapist, which isn't uncommon, she said. EMU purchased the Fletcher School building from Ypsilanti Public Schools this summer for $2.2 million; an anonymous donation of $1.2 million helped to fund the purchase, renovations and first year of operation. But they'll need to do serious fundraising, leaders say, to keep the center running. Future funding will come from many sources, and the eventual goal is to fill coffers and build up endowments so an autistic individual can rely on the center's services for his or her lifespan. Juliana Keeping covers higher education for AnnArbor.com. Reach her at julianakeeping@annarbor.com or 734-623-2528. Mon, Oct 5, 2009 : 2:03 p.m. The first thing to do for ASDs, ADD and ADHD: remove all synthetics from the diet. For ASDs, remove wheat and dairy (gluten and casein) too. Food allergies and intolerances are a huge aggravating factor. Even "normal" people can be helped by removing petrochemical and other artificial food additives (vanillin, FD&amp;C anything, etc). Remove synthetic fragrances and other environmental toxins too. It helped me. Sensory Processing Disorders (SPDs) are a factor too. I'm mostly familiar with vision disorders which can be independent of having 20/20 vision. Regular optometrists and ophthalmologists do not check for these. After you've tackled those two things, especially food, any remaining therapy becomes considerably easier. Support groups such as the Feingold Association can help.